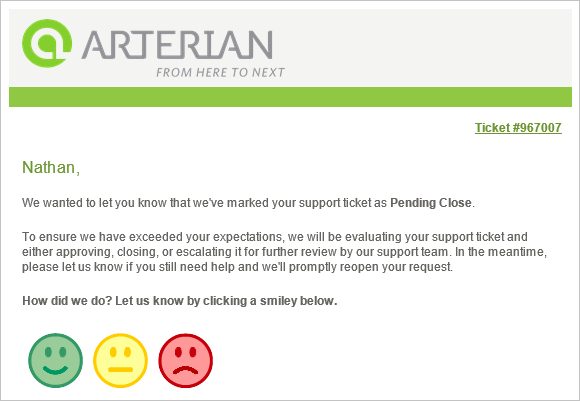 Are you happy with your help desk ticket feedback rates? When we talked to partners and found out that their response rates are, on average, 5% or less we knew there had to be a way to improve that. Feedback is important -- it helps you identify and target areas where improvement is needed, and gain insights from your clients that you wouldn’t have gotten otherwise. But the only way clients will be inspired to give feedback is if you ask for it at the right time, and it’s easy. So what's the best way to improve feedback rates for help desk tickets and make it easy for your clients to share their opinion? That would be SmileBack, our client satisfaction measurement system. SmileBack is a simple, effective way to measure client satisfaction at the end of the service ticket process. It also automatically directs that data to the right people or team, and lets you see your overall key metrics when it comes to client satisfaction. We developed it to be an easy, intuitive way for clients to rate their experience without having to answer complicated questions. What exactly makes it so engaging and easy? Smiley faces, of course. SmileBack is a straightforward both your support agents as well as your clients. All you have to do is add a small bit of code to your closed service ticket status message: this will display the survey to the client. All the client has to do is click the icon that corresponds to their level of satisfaction with the experience (they also have the option of adding a comment). 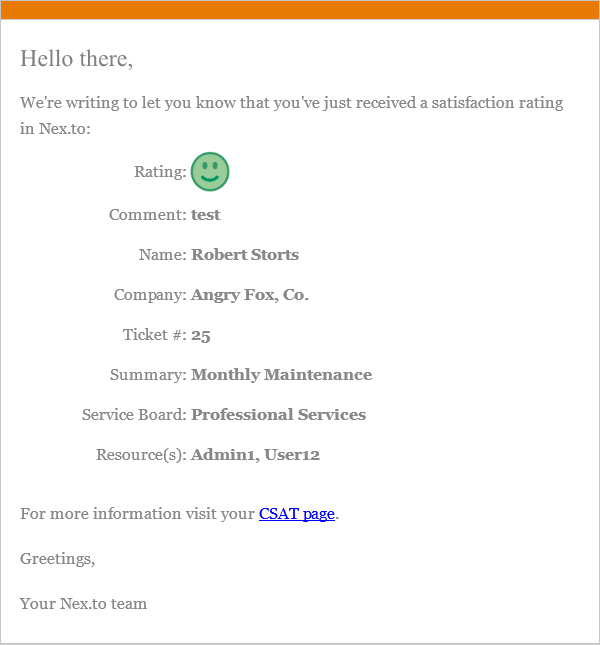 Every time you get a positive rating, for example, you can have it sent directly to the sales team: they can then follow-up with the client, and use it as an opportunity to introduce a new product or service. Meanwhile, SmileBack automatically tracks your overall response rate and satisfaction levels -- helping you to set scalable goals. How does CSAT integrate with ConnectWise? On average, our subscribers get feedback rates around 40%. That’s a major increase over traditional service ticket surveys, and far above the industry average. Plus, that insight into your clients’ satisfaction (or lack there of) is instantly measured and automatically delivered straight to you. We know you’re intrigued: to find out how you can start using SmileBack as soon as possible, head on over to our product page. You can also find plans and pricing information here. Have additional questions? Get in touch at sales@smileback.com or schedule a live demo.